Annual ceremony held in Springfield, IL honoring IL police officers who died in the Line of Duty since last year. 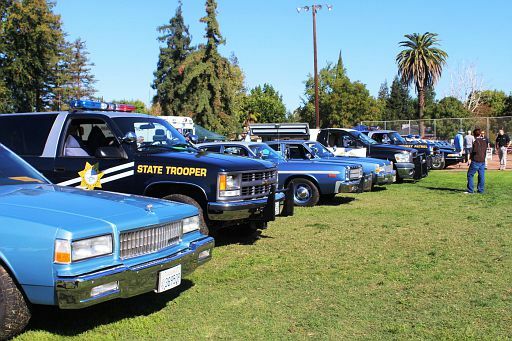 The 24th annual Menlo Park/Ripon Police Car Show and Recruitment Fair was held on October 4th and was a huge success with more than 150 vehicles in attendance. Hosted by Darryl Lindsay. 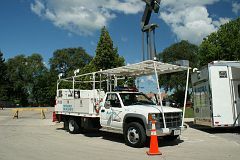 The 17th annual CEVS was held on August 1st, 2nd and 3rd in North Aurora, IL and the IL Railway Museum in Union, IL. 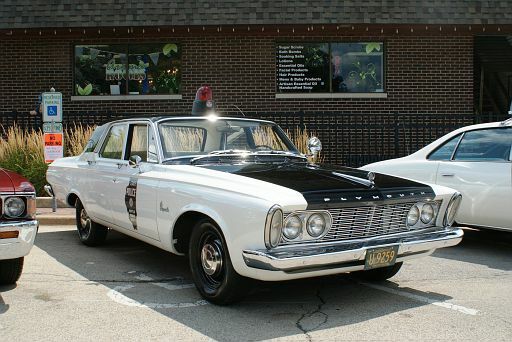 Photos from the 3rd Annual Cleveland Police Museum Car Show. Held on Saturday, May 4th at the Willowbrook Mall in Houston, TX. 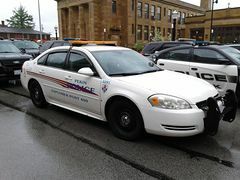 Photos from the first annual Cleveland Police Museum Car Show, held at the Justice Center in downtown Cleveland. Hosted by Greg Savernik. Photos from the 22nd annual Ripon/Menlo Park Antique Police Car Show held in Ripon, CA and hosted by Darryl Lindsay. Photos from the 13th Annual Chicagoland Emergency Vehicle Show on August 6/7/8, 2010 in Mooseheart, IL. Hosted by Dave Weaver. 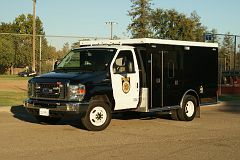 Photographs from the 16th Annual Ripon, CA Police Car Show. Photos from the 10th Annual Chicagoland Emergency Vehicle Show. Photos from the 2007 NYC show by Dave Arnold. Photos from the 6th Annual NYPD Museum Show. Photos by Greg Reynolds. Photos from the show that is known as "The Best in the West"
10/11/12 June 2005. Photos by DAVE ARNOLD. 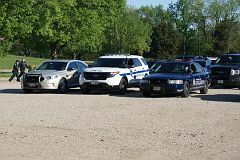 The 13th Annual Dalworthington Gardens DPS Day with the Law was held on June 4, 2005. Photos by Dave Arnold, all rights reserved. Georgetown, DE, hosts an election day event called "Return Day" where the election results are brought to the courthouse steps after voting closes. It's a huge parade with all kinds of dignitaries This year, they invited up all owners of restored police cars to participate. Unfortunately, the weather wasn't so cooperative but the cars that did make it were looking good. Photos thanks to Bob Herrington. Photos by Dave Arnold taken on 10/15 and 10/16 2004. The second annual Live Oak car show at the Live Oak Civic Center. Sponsored by LOPD and San Antonio Police Officers Association. Bellmead's annual car and collectors show. Photos by Dave Arnold. Darryl Lindsay's annual charity show was as usual, a HUGE success. Some 75 vintage and in-service police, fire and various emergency vehicles once again made this event the best show of its kind on the West Coast. 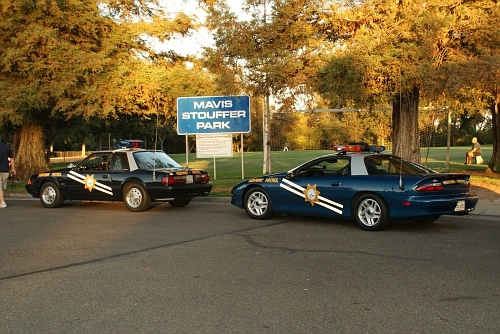 Once again, Darryl Lindsay's annual Ripon, CA charity police car show was a huge success. 75 vehicles came out to enjoy the sunny weather and showed why Ripon is the premier copcar event for the West Coast. The 6th Annual CEVS was a greater success than any previous year. Over 150 vehicles attended. Photos taken at the Mesquite, Texas Pre-NNO event, held in May due to the high heat in August. This included the debuting of the new graphics for the Mesquite PD. The car has been marked for months but hidden from everyone, including officers. Officers were shown the car on the 15th during a departmental dinner when they received their new custom badges, which also now adorn the car. Also debuting at the show was Garland PD's newly restored 1951 Ford, a project that has taken about 4 years. 2002. Thanks to Lt. Nat Bettis. Photographs from the PCOOA 2000 convention in Indianapolis, IN. Photos by Buz Bowling and Greg Reynolds.